Running with an objective to meet the diversified requirements of our customers, we are engaged in offering Hydrogen Gas. We are offering Hydrogen Gas Cylinder. 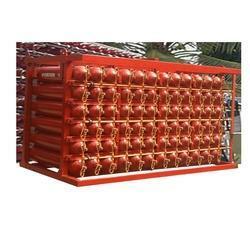 Hydrogen Gas Cylinders - 80 Ltrs. water capacity - 200 Kg. working pressure - 350 Kg. Testing pressure. with Explosive Papers and hydraulic test papers. Matching up with the requirements of our clients, we are involved in offering Hydrogen Gas Cylinder. Hydrogen is colorless, odorless, tasteless, flammable, and non toxic gas at atmospheric temperatures and pressures. We have gained huge success in rendering high in demand Hydrogen Gas Cylinders. By using modern machinery, our vendors manufacture these cylinders in accordance to the industry laid norms. Counted amid one of the reliable names of the country, we are occupied in the arena of presenting a top class spectrum of Hydrogen Gas Cylinder. Owing to the wide experience in this domain, we are instrumental in offering Hydrogen Gas Cylinder to our clients.